Wholesale bleach proof hand towels used in hair salons, nail salons or any business looking for towels which can be washed in bleach. Large size of 16x26 extra soft and high end deluxe quality towels. Why deal with the constant worry that you’ll have to replace your colorful hand towels because of spotting, stains and faded areas? Our bleach-resistant hand towels in navy are the perfect solution to all your towel needs. Not only do they feature a classic blue shade, but they’re also constructed from fluffy, bleach-resistant cotton. Order all the navy, bleach-resistant hand towels you need to supply every member of your household. Towel Super Center allows you to stock up and save with every purchase. You’ll enjoy discount prices without the need to join a wholesale club. Simply click and save! Why do so many hand towels get bleached by mistake? We throw them into the laundry with whites, never realizing they came along for the ride. We use them to wipe up sudden spills and expose them to cleansers that include bleaching ingredients. We use them to wipe up acne and other topical medications that contain bleaching elements. We utilize them when we dye our hair at home. Instead of reordering towels on a regular basis, it’s time to move to bleach-resistant varieties. Worried that your navy, bleach-resistant hand towels won’t be comfy to the touch? Even though they have anti-bleach protection, they’re still 100 percent cotton. That means they’re super-soft and great for people with sensitive skin. They’re also tremendously durable. You won’t have to worry about your hand towels prematurely pilling, fraying, tearing or falling apart. You’ll be able to use them again and again. Where could your home use a supply of hand towels right now? Many households like to keep these 16” x 28” towels in their powder rooms, guest bathrooms, master baths, kids’ bathrooms, pool areas, home gyms, kitchens, garages and hall closets. No matter where you keep them, you’ll be sure to use them regularly! 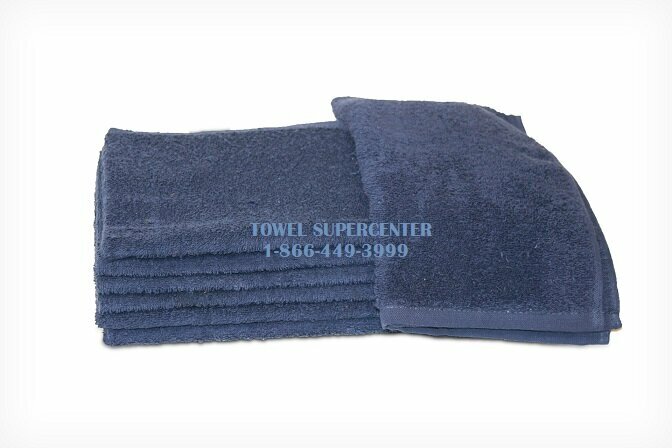 Have questions about these or other Towel Super Center products? Contact us today for great customer service.